Born into a musical family - the youngest child of ten - Geniro’s interest and passion for music materialized early on in his childhood. At the age of five, tagging along to his older brother’s band rehearsals, he would find himself performing in front of his very first audience, at one of his older brothers wedding. Geniro sets his career on course with the release of his debut album, 21 Days. A skilled performer, Geniro is no stranger to the stage. As a child, he played the drums in his brothers’ bands performing in many diverse settings, which included local nightclubs, in Toronto and as far as Sweden. But the drums were just the beginning. By 16, Geniro had turned his attention to the keyboards. Able to experiment with his own sounds and grooves, he began to truly develop his craft and delve into the world of songwriting. 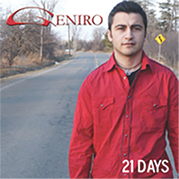 On 21 Days, Geniro’s role moves beyond singer and songwriter to include producer. With the exception of four songs - “21 Days”, “Longtime”, “Runaway” and lonely” - that see Geniro teaming up with Yurko Mychaluk and George Vacval, the rest of the album was entirely self-recorded and self-produced. Recorded in Toronto, the album introduces 10 musically striking original songs. Led by the first single and title track “21 Days”, the album muses on life and love, charging with raw emotion and a fervent vocal style. Instantly memorable choruses are fundamental to the mix as the album continues with the flirtatious beats of “Unbelievable Lady”, to the Mediterranean flavor gem “Lonely”, to the disco-tinged closer, “1 Night Stand”. A dynamic first effort, 21 Days reveals an artist with an abundance of talent and musical diversity. By merging his personal style with today’s modern sounds, Geniro creates a style uniquely his own. Blessed with a sincerity and integrity instilled in him from a very early age, Geniro is poised to place his mark on the nation’s musical landscape. Form received thank you for contacting us.